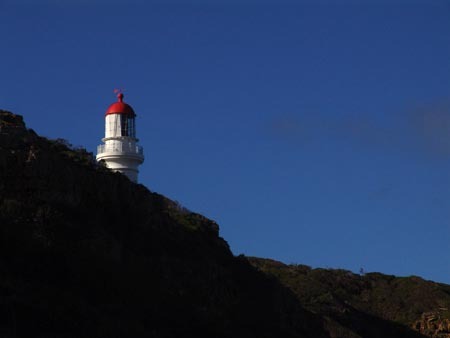 We left Melbourne on the morning of the 10th, picking up Beatrice (our rental car – a Mitsubishi Lancer) and heading West. 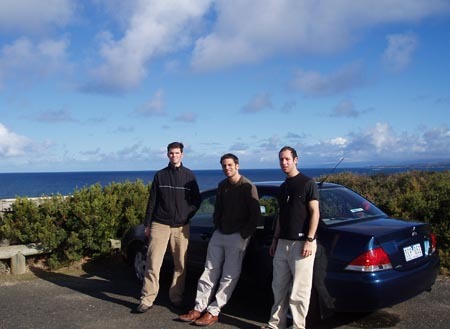 We drove to the start of the Great Ocean Road, a scenic highway that runs along the south coast of Australia for a few hundred kilometres. 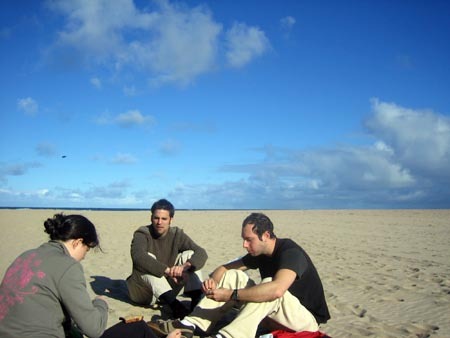 We stopped for lunch at Aireys Inlet, where the others reluctantly agreed to eat at the beach instead of at a picnic table. We stopped at a few touristy stops and pulled off the road when we saw a sign advertising cheap accommodation in Princetown. Now, Princetown is one of the locations in bold letters on our map, so we expected a fair range of accommodation and shops. We drove up to the hostel with the roadside advertisement and after a few minutes of talking with the owner, Jos and Ron came back to the car and told us to go in. After paying and all that, we asked how many people live in Princetown. “Let me see,” she said, as she raised her hand to use her fingers for counting, “two, three, five, eight.” I was going to ask whether she meant eight hundred or eight thousand. Turns out she meant eight. She wasn’t lying. Nice place though, and a really excellent hostel. Really nice lady, and free breakfast is always a moneysaver. That evening we watched a movie in the hostel and slept. 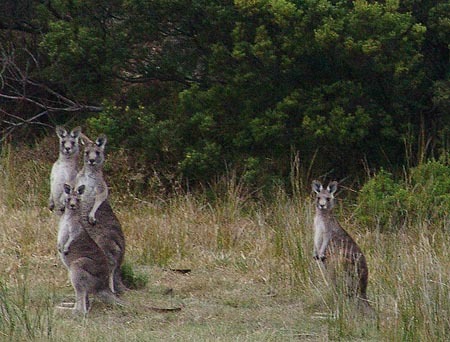 The next morning, we woke up and took the lady’s suggestion of going for a morning walk and seeing wild kangaroos. Sure enough, after some time we spotted a few in the distance. We climbed through, over, and under some barbed wire fences to get close enough for photos, and followed the mob for a while (a group of kangaroos is usually called a mob, though it can also be called an aggregation) before returning to the track and heading back to our hostel. 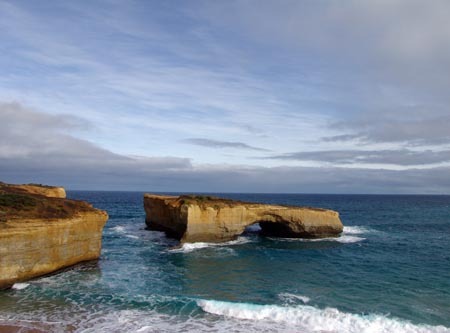 We drove from Princetown to Warrnambool that day, stopping at the Twelve Apostles, Bay of Martyrs, and looking at the Bay of Islands from the car as we drove by… all rock formations of various sorts off the coast. 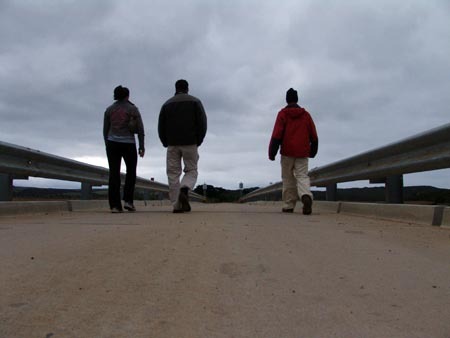 This pic is London Bridge. Well, it WAS London Bridge. What you see used to be connected to the mainland by a natural bridge of rock. In January, 1990, two tourists were stranded on the newly formed island for several hours before being rescued by helicopter after the bridge collapsed. This collapse is typical of the way in which these cool rocks form, with water eating away at the sedimentary rock until it turns into little rock islands and such. 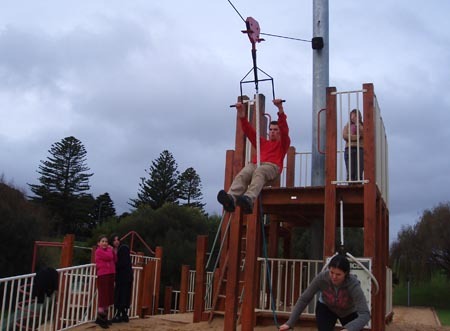 In Warrnambool, we saw something we decided we couldn’t miss – the Lake Pertobe Adventure Playground. 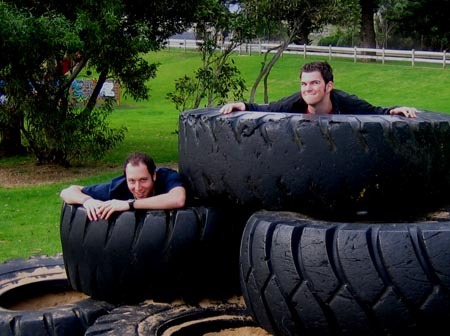 First we jumped into some huuuge tyres (they spell tire ‘tyre’ in Australia, same as in NZ and the UK). Jos won the race to the fortress in the middle, and I got second place. But on our race out, I won! Jos, Marcus, and Ron all ran out the entrance instead of the exit! Wooohooooo! Next stop, the FLYING FOOOOOOOXXXXXX! 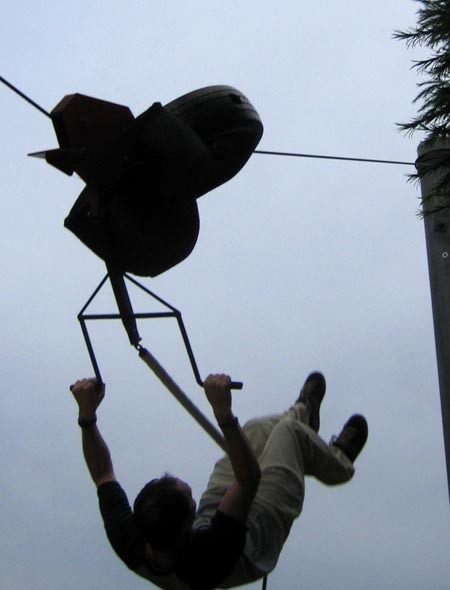 Flying foxes in Vancouver are designed for little kids and you need to hold onto the handles and hang in the hair. 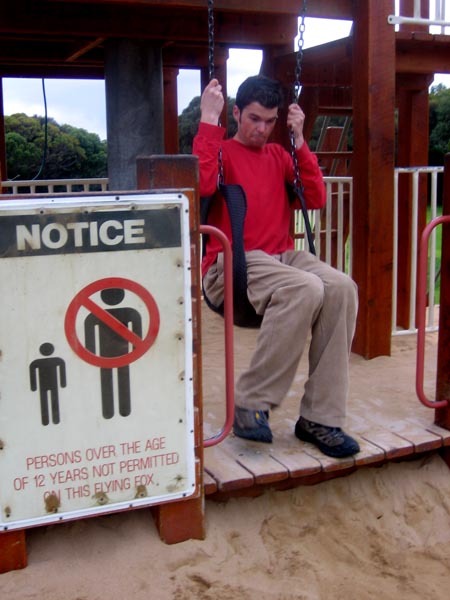 This adventure playground had two, count ’em TWO flying foxes – one for under 12 yrs and one for over 12 yrs. Of course, we tried them both. (Sorry both pics are me… couldn’t find good pics of the others). The big one was a serious flying fox. It was a bit scary getting on, and the first time I did it, this parent pulled the rope to make me go faster! At the end of the cable, the thing that stops you is a tyre bumper on the cable. Of course, since you’re still travelling fast, the wheel thing hits the tyre bumper and you, hanging below, keep moving. The result: you flip nearly upside down then back again! 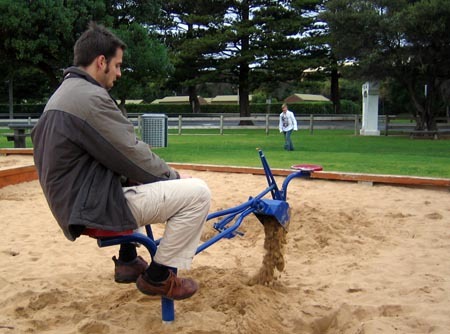 The flying fox then rolls backwards slowly to the middle of the cable length where you can climb off at sand level. What a rush! While the rest of us chased ducks and funny looking birds, Marcus decided he’d had enough of this monkey business and set about doing some more serious work. 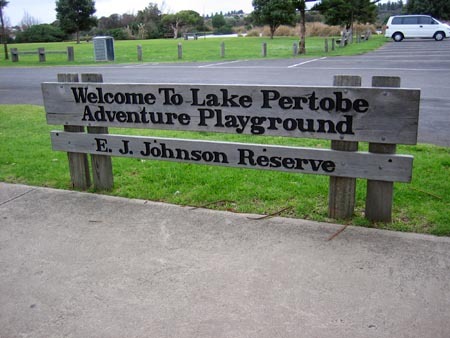 The Lake Pertobe Adventure Playground was by far the highlight of Warrnambool, and perhaps (for me at least) the highlight of our Great Ocean Road trip so far… not sure yet. looks fun! 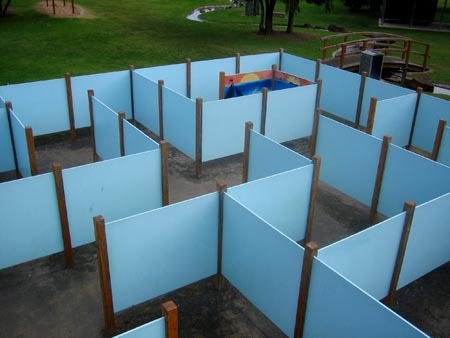 how come we don’t have a playground like that in vancity?? ?